The following video, Requiem For The Sea, was filmed at City Island, New York, a historic seaport community in New York City. I did the filming for my friend, Hyonok Kim last year while studying film at the New York Film Academy. Hyonok is a dancer by training and she teaches at a university in South Korea. She has won a number of awards related to her work with dance. The video tells a story of loss and death through dance and the use of stunning visual images and symbolism. If you find the sea to be relaxing and peaceful, this video will not disappoint. It is a work of art. Originally inhabited by the Siwanoy Indians, who lived during the summer on the plentiful clams, oysters, and fish they found here, City Island was first established as an English settlement in 1685. Ideally situated to supply schooners traveling between Manhattan and points north, the island became an important shipping building and yachting center during the 18th and 19th centuries. The two world wars brought about a conversion from yacht building to the construction of submarine chasers, P. T. Boats, landing crafts, tugs, and mine sweepers. City Island also became the site of a quarantine station, as well as the Hell's Gate pilot station. After World War II, yachting returned and with it the building of 12-meter sloops that successfully defended the America's Cup, including the Independence, the Enterprise, and the Courageous. Today, the presence of yacht clubs, sailing schools, sail makers, marinas, fishing boats, and marine supply and repair shops reflect City Island's historic role as a nautical community. I've always loved this song, My Immortal, by Evanescence. It was one of the songs that inspired my decision to leave a career of fourteen years. I was looking at music videos on You Tube and I came across the song and as I began watching the video, I suddenly spotted Placa de Sant Felip, a location in Barcelona that I previously wrote about here at Thought Theater. If you have time, take a look at the full posting. There are some additional pictures worth viewing. I've included an excerpt from that prior posting just to explain how shocked I was to find that the song that inspired me to drop everything and set out on an adventure around the world was filmed at the most memorable site on that trip. I've also included some photos from my trip. Placa de Sant Felip is truly a magical place and one I think everyone should visit. While visiting the city I met a man named Javier who graciously volunteered to show me the sights. We saw many things including some of Gaudi’s architectural gems, the Picasso Museum, and my favorite, the Gothic district. This is one of the older areas of Barcelona and it’s a maze of attached buildings with most streets only suitable for foot traffic. As the day came to a close around dusk, Javier led me to a place called Placa de Sant Felip Neri, a charming square tucked away down one of the winding walkways. The lighting at the time gave the square a mystical air that made the moment almost breathtaking. 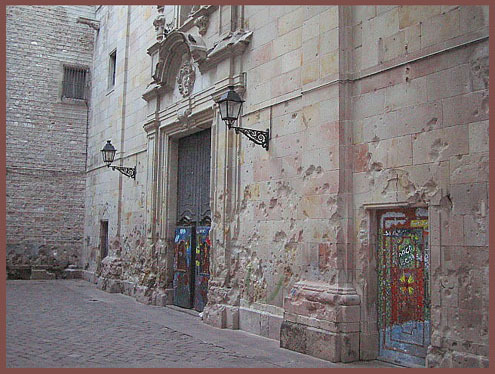 Javier, who spoke only the slightest amount of English, explained to me, mostly in Spanish, that it was a site where, during the Spanish Civil War, people were lined up in front of a small church and executed. 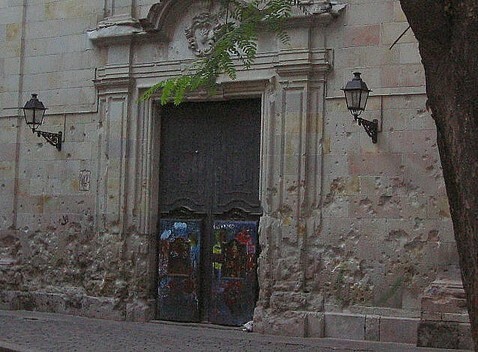 The front of the church is covered in pockmarks and divots from the splash of bullets. It was stark and real and amazing all at the same time and I couldn’t help but think about the people who met an untimely end at such a beautiful and tranquil oasis. Much to my disappointment I had forgotten my camera that morning but I vowed to myself that I would return to take pictures. The next day I stopped at the front desk of my hotel hoping to get directions or a map to guide me back to the plaza. In broken Spanish I explained what I was looking to find and the clerk indicated he knew the place but it would be too complicated to try to give me directions. He suggested a map but I didn’t have the actual name of the plaza and he couldn’t recall the name either. Determined to find it, I set out alone for what turned out to be an amazing and remarkable day. I scoured the Gothic for hours trying to retrace the path from the day before but I could't locate the plaza. As it got to be late afternoon, I accepted I wasn’t going to find it so I decided I would go back to the hotel and ask again for help to search once more the following day. Resolved, I began walking back towards the hotel. I turned down a street just as a musical trio (these groups are found all over the city) was finishing a song. As I approached them, they began to play Amazing Grace…I turned at the corner where they were singing and there stood the plaza I had searched for all day. Fully overcome, I literally shed tears on the spot. Something about that moment felt so true and so right…there was something sacred about where I had arrived and I was overwhelmed by the thought of the fate that befell so many people. I wanted to know their stories and wondered what happened to their friends and families. In my mind, I had the thought that everyone in the world needed to see this place…to understand just how precious life really is…and to realize how wrong it is to take that away. Since my return, I did some research on Placa de Sant Felip. What I found was even more compelling. There is an old cemetery that lies underneath the site. In addition to the executions, a bomb also killed thirty school children in the plaza during the Spanish Civil War. Lastly, Antoni Gaudi was run over and killed while on his way to the plaza in 1928. In one of the articles I read about Placa de Sant Felip, I was struck by this statement “The squares ghosts are peaceful ones, however, and in the early evening light of a summer’s day there can be no more beautiful spot in the city". I thoroughly agree and I couldn’t have said it any better. "Global Mobile" is a recurring posting here at Thought Theater. The objective of the category "Traveliscious" is to provide information about places around the world with a focus on sites of significance and substance. I've never been that fond of high traffic tourist attractions although there are some locations worth seeing regardless of the numerous rubber-necking tourists you will be forced to endure. Readers are also encouraged to use this category to introduce remote, yet noteworthy destinations along with their own memorable recollections. 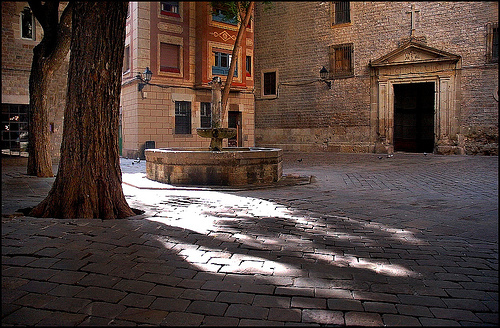 My first entry is about Placa de Sant Felip in Barcelona, Spain. For me, it's truly one of the world’s unique jewels. It’s a place with overwhelming human spirit, substance, and significance. If you ever travel to Barcelona, it’s an absolute must. Barcelona is a city teeming with culture where the people have a vibrant and infectious pride and passion for their colorful history. There is an unyielding energy from sunrise to sunset. The streets are awash with people all hours of the day, especially at Las Ramblas, a favorite boulevard with a broad pedestrian walking island running the center of the street. As a major social area of the city, you can buy virtually anything you want including food, flowers, birds, and bunnies. 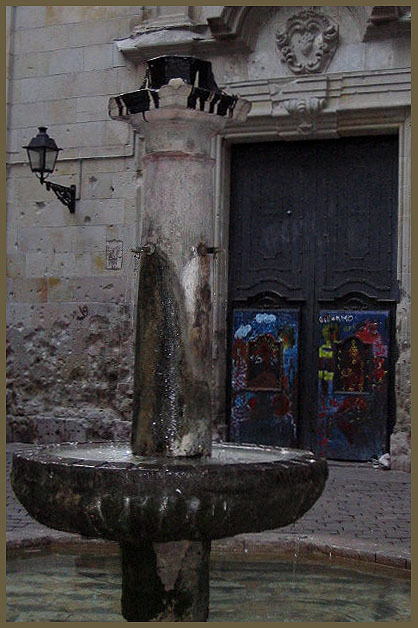 The Spanish culture is unique. Midday siestas see many of the businesses close for around two to two and a half hours while many restaurants remain open to accommodate the lunch crowd. Breakfast is virtually a nonevent…people seem to grab something on the way to work and the choices are limited to baked goods and more typically a traditional snack that includes a slice of cured ham on bread. After siesta, the businesses stay opened till around seven in the evening. Shortly thereafter, the city transforms into a social and cultural wonder as people walk the boulevard with wives and mothers on the arms of husbands and daughters. By ten at night the restaurants begin to fill for dinner…seemingly late by American standards but the norm in Barcelona. Following dinner, with typical Spanish charm and chivalry, husbands buy flowers for wives or for an elder parent as they make the stroll home. 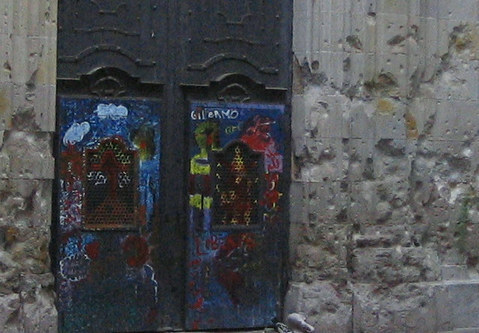 This is the wall of the church and the entry doors. see the pattern of a face created by the deluge of bullets.